Sister Dorothy Payne died on February 3, 2019, and was buried at St. Joseph’s Villa on February 7, 2019.. Sister Dorothy’s entire life was spend in education and her firm belief was that “Every child is a story yet to be told.” Sister devoted her life to listening to those stories as they unfolded with joy, confidence, and hope. This quintessential educator died at the end of Catholic Schools Week. She waited until after this special time to go home to God. Her cousin Joan was her close companion throughout her entire life. At Holy Family Academy, Dottie met the Sisters of St. Joseph, and through their inspiring example, she felt that God was calling her to religious life. Joyfully, she embraced her vows and lived a life of poverty, chastity, and obedience. This sister embodied our Constitutions that define a true SSJ as one with a “cordial and hospitable spirit, ready for any good work, a quiet sense of hiddenness coupled with a desire to serve to the best of our ability, characterized our response to the people of God.” A sister who once lived with Dottie said that she was a true believer “that love is shown in action.” This woman of faith was thoughtful, fun loving, selfless, kind, direct, and a Giant’s fan. When Dottie celebrated her Silver Jubilee, she wrote to her family that the words of the hymn, “Take, Lord, Receive” was one of her favorites, and she paraphrased the verses to say. “Dottie, you have been chosen and are fortunate to have entered a love relationship with your God. Much is going to be asked of you. You must be open to whatever God asks of you.” And she was, even in the midst of challenges that demanded sacrifice. Her story continued to be told as she served in the Archdioceses of Philadelphia, Newark and Trenton as an elementary school teacher, principal, associate superintendent of school, and as President of Trenton Catholic Academy for the past 14 years. In these leadership roles, she manifested a collaborative style, encouraged lay leadership, and empowered others. Always, she was passionate advocate of children with a special concern for those in the greatest need. As the President of Trenton Catholic Academy, Dottie’s duties were eclectic and challenging. This herculean task involved working with four elementary schools and one high school, reconnecting with alums, building school spirit, cheering at various sports events, collaborating with pastors, and working to create a warm and hospitable environment for all students and teachers. With her belief that “every child is a story yet to be told,” Dottie became a strong tenet in that narrative. In 2012, Sister Dorothy was awarded the Cross Pro Ecclesia et Pontifice, a high honor from the Pope, in recognition for her distinguished service to the people of God through her commitment to education. During the past few months, even with the recurrence of cancer, Dottie continued to connect with the Trenton Catholic Academy community via emails and phone calls. Her Christmas video to the students and her mid-January visit to the school on her scooter are memories that the students and faculty will cherish. Sister Dorothy’s story as a Sister of Saint Joseph is full of grace and selfless love for others. She served God, the Church, and our Congregation exceptionally well. As your earthly story ends, let your heavenly one begin. 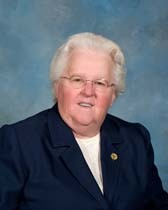 Sister Dorothy, may you rest in God’s peace and joy. Did she teach St Andrew’s Bayonne, NJ? Sr. Dorothy was such a wonderful and delightful person. She was Principal at St. Rose in Belmar where both my daughters attended. I always remember her with a smile on her face and being so kind to all the students. Our family thinks of her often and hope that she is at peace.